Committee To Elect Woody Degan to Tennessee State Senate District 32; Official Endorsement From TN 8th Coalition Tea Party! We've got a NEW VIDEO coming soon from one of Tennessee's Health Care Executives who will expose the ugly truth concerning the state's lack of REAL Health Care Reform Initiatives. Programs that allow developers to destroy a wetland or move a creek if they pay for mitigation elsewhere have members of the environmental and business communities complaining. They have been in operation for several years, and TDEC has called the bill a mere housekeeping matter. But it has unleashed a storm of questions about where the money goes, whether the environment is served and whether property owners downstream suffer. The state's policing of the changes that the program allows is under challenge, too. "This is not just a little bit clogged up with algae," said Barry Sulkin, an environmental consultant with Public Employees for Environmental Responsibility. He nodded toward green, ropy strands of algae that matted a creek near the Indian Lake Village shopping area in Hendersonville. The little waterway -- not showing signs of a healthy creek that meanders through trees -- moved in a fairly straight channel. The sun shone down on the waters, promoting the growth of algae that, by day, smothers the creek and, by night, robs the water of oxygen, which can make it uninhabitable for much aquatic life. Halo Properties LLC had sought permission about four years ago to shorten and move the creek. It agreed to pay $140,000 to the Tennessee Stream Mitigation Program for the approval to do so. The company also contracted to pay $27,000 to fill in a 0.39-acre wetland elsewhere. The money for wetlands was paid in 2008 to the Harpeth Wetland Bank, but documents show the $140,000 was not, despite the requirement. "My understanding is it is being paid," said Danny Hale of Halo Realty in Hendersonville. "Either it has or it will be," he said. He was a partner in Halo Properties but said that company is in receivership. He said the property was sold two years ago. Hale has his own issues with making payments to a fund, particularly to a wetlands mitigation bank. "If they're interested in protecting wetlands, they should purchase them," he said. "That should be the function of government. "The problem is when we put that burden on the private individual and not on the population as a whole." Wetlands are an important part of nature's flood storage and water filtration system, and creeks feed and contribute to the health of rivers that provide drinking water and support wildlife. The little creek in Sumner County is one of the tributaries of Old Hickory Lake that are part of the Cumberland River, which runs through Nashville. A road was built across the property where the creek was shifted and the wetlands removed, but no development was built. In January 2009, the state issued a notice of violation to Halo Properties, on grounds that included the failure to pay the $140,000. An official invoice to Halo from the stream mitigation program was not sent until November 2011, though Halo asked for one earlier. One of two annual required monitoring reports of the site where the stream was shifted has not been received, TDEC officials said last week. The issue is being assessed by the state's water pollution control division, Meg Lockhart, TDEC spokeswoman, said Friday. Sulkin's group and the Tennessee Environmental Council, meanwhile, are taking action on a situation they say has only lingered. They said they sent notice Friday that they intend to sue Danny Hale of Halo for polluting streams. The company has failed to meet requirements, including not having paid the stream mitigation money, not planting enough trees and not establishing a 50-foot buffer on each side of the stream, they say in their letter. Sixty-day notice is required under the Clean Water Act, and TDEC and the U.S. Environmental Protection Agency were among those to whom the letter was addressed. When told of the potential lawsuit on Friday, Hale said he wasn't in charge of permitting or construction on the project and no longer has a role. He said he couldn't comment further. Hale is one of the businesspeople who blasted TDEC in round-table talks Gov. 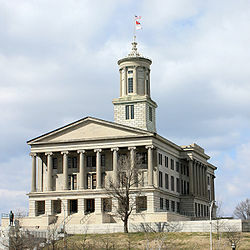 Bill Haslam held last year as comments were sought on how to make the state more business-friendly. Environmental attorney Elizabeth Murphy told lawmakers in the House Conservation and Environment Committee last week that the program permitting changes to streams in exchange for money isn't legal and doesn't protect those downstream. Murphy said SENATE BILL 2211 (SEN MARK NORRIS)/House Bill 2349 to put language in state law validating the programs would "make it law of the land that our streams and our wetlands are open for wholesale auction." She said Wolf River Airport, a client of hers, flooded after almost a mile of stream was altered by another property owner who paid $947,000 into the Tennessee Stream Mitigation Program. The program is part of the nonprofit Tennessee Wildlife Resources Foundation. "Instead of trying to figure out what they could do right there, they sent cash to the foundation," Murphy said. "You're taking public resources, cashing them out and putting them into private hands run by uncontrolled, unregulated people, " she said. Joey Woodard, who heads the foundation and the stream mitigation program, said later that oversight is strict, with the EPA, Army Corps of Engineers, TDEC and U.S. Fish and Wildlife Service among the agencies having to sign off on any proposed projects. The money goes toward fixing damaged streams in the same watershed and as close to an affected site as possible, he said. Measures include shoring up banks, adding meanders and planting shade trees. About 55 miles of stream has been or is being restored since 2003. TDEC officials have said that property owners should look at on-site options before paying money for mitigation elsewhere, and that permits aren't given for projects if it's seen that downstream owners would be harmed. In the hearing, TDEC attorney Alan Leiserson said the wetlands banking and stream mitigation programs have been in effect for years and are important options. Mitigation is already mentioned in the regulations, he said. Rep. Mike McDonald, a Democrat from Portland, was among several lawmakers who had concerns about protecting those downstream, while Rep. Frank Niceley, a Republican from Strawberry Plains, didn't like the way the program was set up. "You show me a nonprofit and I'll show you bloated salaries and padded expense accounts," Niceley said. TDEC officials say the overhead for the operation remains at an acceptable 10 percent or less. (Editors Note: There is no way to know whether there is a 10% or less overhead, as the program runs OFF THE BOOKS of the state, with NO OVERSIGHT.) Wetland banks and stream mitigation programs are found around the country as a way to try to keep from eliminating more miles of streams and wetlands, which are already diminished. While the programs overall don't increase the miles or acres that exist, they are promoted as a stopgap way to halt further loss while allowing development. The bill to codify the programs alarmed one major group of conservationists and environmentalists last week, but mainly in how it was written. Stewart Clifton, representing Tennessee Conservation Voters, said the bill should specify that the preference is for finding a way to avoid disruption to a stream or wetlands before opting instead to pay money to a program. Also, he said, the wording should say that consideration must be given to putting any mitigating project close to the site. "There's no guarantee that the funds paid into it even very indirectly help the people in the area where the impacts happened," Clifton said. Sulkin said the continued moving of creeks, putting sections in pipes underground or otherwise radically manipulating streams instead of designing them into a development, is amounting to "death by a thousand paper cuts" for waterways. "We have fewer and fewer streams in this state and country today," he said. Wetlands banks move the availability of flood storage from one place to another, he added. Dan Eagar, manager of TDEC's natural resources section of the water pollution control division, said that the wetland banking and stream mitigation programs are providing a needed service. He also said his department encourages working around water features and has had some successes. A stream still flows naturally through property where a Wal-Mart was built on Nolensville Pike he said. Bridges were built over the stream, which bisects the parking lot. The Tennessean water-paine Programs that allow developers to destroy a wetland or move a creek if they pay for mitigation elsewhere have members of the environmental and business communities complaining. water-paine The latest controversy erupted after the Tennessee Department of Environment and Conservation placed a bill before the state legislature to codify the programs in state law. Wetlands are an important part of nature's flood storage and water filtration system, and creeks feed and contribute to the health of rivers that provide drinking water and support wildlife.